Many of us take a keen interest in our pre, intra and post workout supplements, but how many of us take an active interest in our pre-sleep supplements? There’s more to night time supplementation than a constant drip feed of amino acids that can be provided by casein protein. One key night time supplement you might be missing out on is ZMA, so what is ZMA and what are the potential benefits it can provide? 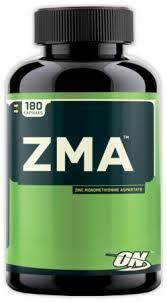 ZMA is an acronym for zinc monomethionine aspartate and magnesium aspartate. ZMA is a synergistic blend of two minerals, zinc and magnesium and a vitamin, vitamin B-6. These three compounds are extremely important for anyone who is involved with regular exercise and has been clinically proven to significantly increase anabolic hormone levels, support the production of free testosterone, increase muscle strength and aid the recovery process of athletes. ZMA’s primary function is to aid in a quick and efficient recovery whilst you sleep. Why should I use a ZMA supplement? If you train regularly and want to take your results to the next level then a ZMA is the next logical step. It’s important to expand your horizons and look at more than just your pre, intra and post workout supplementation. Those of us who workout a lot or even everyday can fatigue and wear down quickly from constant and prolonged sports performance; a ZMA supplement allows those who train regularly to maximise their muscle repair and support all that hard work in the gym. So why should I start taking ZMA? Zinc is essential to numerous chemical reactions in the body, including protein synthesis and cellular energy. By providing your body with these three essential ingredients, you can help it stay on track for steady repair, rather than burning out from exhaustion. ZMA’s connection to free testosterone production in the body is great for anyone wanting to build muscle or burn fat. A ZMA supplement is great for supporting rest during Rapid Eye Movement (REM) sleep, the most restful kind of sleep – good for repair and recovery especially for the recovery of the central nervous system. Besides all the potential benefits discussed earlier that can contribute towards a lean and muscular physique, there are other more specific health benefits that should be considered as well. Individuals who train regularly are more susceptible to losses of vitamins and minerals as a result of perspiration and prolonged muscular contractions. This makes the supplementation of ZMA particularly important for bodybuilding as prolonged bouts of intense exercise will result in rises in blood sugar levels and increased urination, increasing the loss of magnesium, zinc, B12, B6, folic acid, and many other nutrients. Weightlifting sessions that regularly include intensifiers such as drop sets, supersets and rest pause techniques are also very draining on the central nervous and immune system. Zinc supplementation has been proven to have a positive effect on decreasing levels of oxidative stress and reducing inflammation throughout the body that these weightlifting techniques can cause which will decrease recovery times and increase how quickly you can repair your muscle. Controlling and regulating immune responses. Attacking infected or cancerous cells. Zinc deficiency profoundly affects the immune system because low zinc produces a direct and rapid decline in T cell function. T cells elevate the body’s immune system when viruses, bacteria, or challenges to health arise. The bottom line is that for anyone who is serious about building a lean and muscular physique or for athletes who train regularly, a ZMA supplement is a must. The benefits of the three compounds that go into the creation of ZMA are invaluable for creating a strong and hormonally efficient body that can recover quickly and effectively. It’s a great supplement that gives you the synergistic blend of vitamin and minerals you need which have been shown to increase testosterone levels, strength gains, improve your quality of sleep and increase your rate of recovery. Not only this, it also helps to negate the potentially detrimental effects that prolonged and intense bouts of sports performance can incur such as loss of magnesium, zinc, B12, B6, folic acid, and many other nutrients as a result of increased blood sugar level rises and urination. A ZMA supplement is useful not only for your health and wellbeing but also for improving your muscle building and recovery potential.